Klikni sem pro èeskou verzi. Creaxin1 is new freeware tool for IBM/PC with OS Win9x. 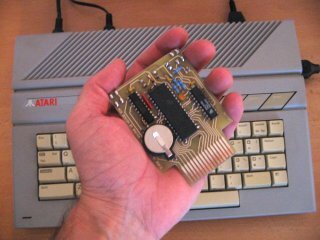 It make possible to create package of Atari programs/games, which will be stored in S/XEGS RAMcart 128KB by C.P.U. Title Creaxin1 comes from "Create X in 1". It means this tool creates ROM image or Atari executable feeder program for X programs in one cartridge. Up to 24 programs/games in one package together. 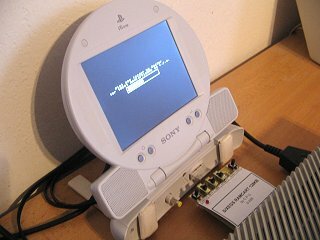 Capacity 126.4 KB for programs/games (system loader routines have 1.6 KB). Support for add programs by drag-and-drop method. Relocatable loader with autodetection of location for loader routine (also manual setting is possible). Support for optional autorun of program A ("Autorun A" checkbox). Completed package can be saved as SXEGS ROM image file (32, 64 or 128KB), or as executable Atari XEX feeder program, which will load data to SXEGS RAMcart memory. Automatic detection and reverse import of saved ROM image file or XEX feeder program file. After the XEX RAMcart feeder finish (message arrive on screen), you have to turn off RAMcart WRITE switch and run RAMcart by Atari Reset key. RAMcart have to be in SXEGS mode. Yellow background color indicate that disable RAMcart operation failed. 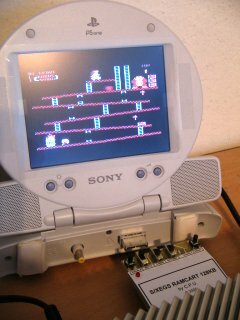 Start of program/game by key A-X or selection by joystick in port 1 or 2 (up/down directions) and start by fire 1 or 2, or selection by keys select/option and start by start key. Complete memory cleanup (also memory under the OS ROM) is performed before each program is loaded and started. Loader doesn't use any zero page registers even other memory out of its area. Default it is located in stack area $0100-$01C0, but it is possible to move it from $0400-$04C0 up to $7F00-$7FC0. You can hold down Atari SHIFT key for delay of program starting after load. It can helps with programs which write some values to $d500-$d5ff area (it enables the RAMcart and that's why system crash arrive). So, if you will hold down SHIFT, you can switch cart to XEGS mode manually after loading, and then release SHIFT key. Each program has own detailed informations. 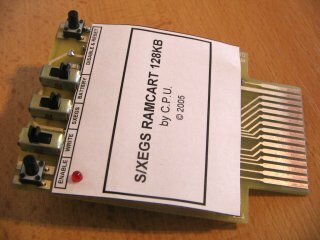 S/XEGS RAMcart 128KB by C.P.U. menu with all the programs is showed on screen. will be loaded and started immediately. or when RAMcart is pushed out of cartridge slot. 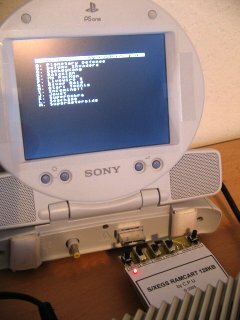 2007/05 - Creaxin1 v1.03 (81kb) - support for program selection by joystick in port 1 or 2 (up/down directions) and start by fire 1 or 2, or selection by keys select/option and start by start key.